Did your sixteen year old self leap for delight when this show was announced last week? Nu-metal or not, there is ridiculous levels of excitement for this tour. 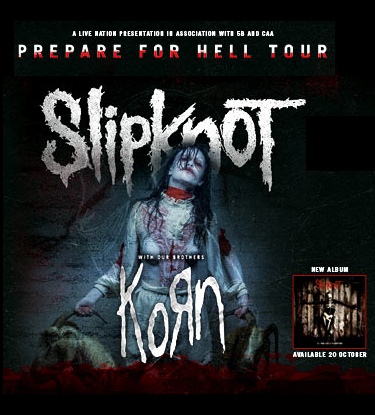 The return of Slipknot and a chance to see KoRn back on an arena stage where they belong. Slipknot’s history is Ireland has been far rarer than KoRn’s making this an extra special show for fans. Many, like myself, will remember the disappointment of their last minute cancelation of their first Irish show way back in 2000 or 2001 after a ****ing parents group or some s**** had them banned. They made it up though when they finally made their debut appearance supporting Metallica in 2004, going on to be every bit as incredible as reports had hailed them to be. They even managed to win over the naysayers while they were at it. One final gig occurred in 2005 and it’s been silent since. Now with a new album out (TODAY) and a new line-up, the Knot are coming back. No matter how much you (talking to the cynical older crowd here) thought you’d moved on and shrugged off that haircut, you’ll probably wish just a little bit you already had your tickets., it’s not too late my friends, it’s not too late. it will be if you wait much longer of course so go but them. There was supposed to be a competition on Tickets There but my own honesty has made sure that’s not going to happen. if you expect Tickets There to do it for you, you’ll be waiting a long time. Tickets available for Slipknot and KoRn’s January 14th show at the 3Arena are on sale now priced €59.50 from Ticketmaster.ie and outlets nation wide. This entry was posted on October 17, 2014 at 2:36 pm and is filed under Gig Listing, Music, News with tags 2015, Dublin, Korn, Slipknot, ticketmaster, tickets, tour. You can follow any responses to this entry through the RSS 2.0 feed. You can leave a response, or trackback from your own site.